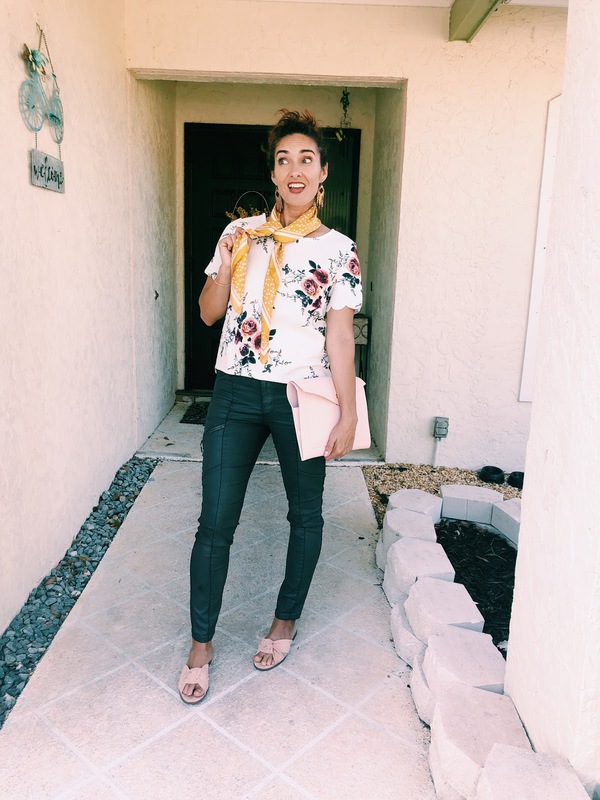 Spring is almost on its way out in Sarasota and the humid temps are on their way in, so I thought I'd seize the opportunity to wear my faux leather gray pants before it's too late! As for the portfolio clutch, it was my most anticipated Causebox item, however it quickly became my biggest (momentary) disappointment. Read on to hear more and see the full Spring subscription box! We will get to that later as well, but for now let's get back to Causebox. 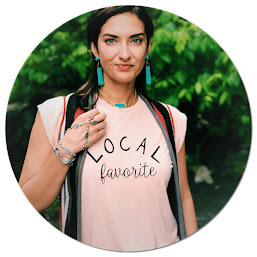 "A quarterly curation of socially conscious lifestyle products for women. Every box is filled with products that have a story and make a difference." Each quarterly box is $54 or $200 up front for a year. Each box is designed by an artist, so who wants to discard them?? Not me. 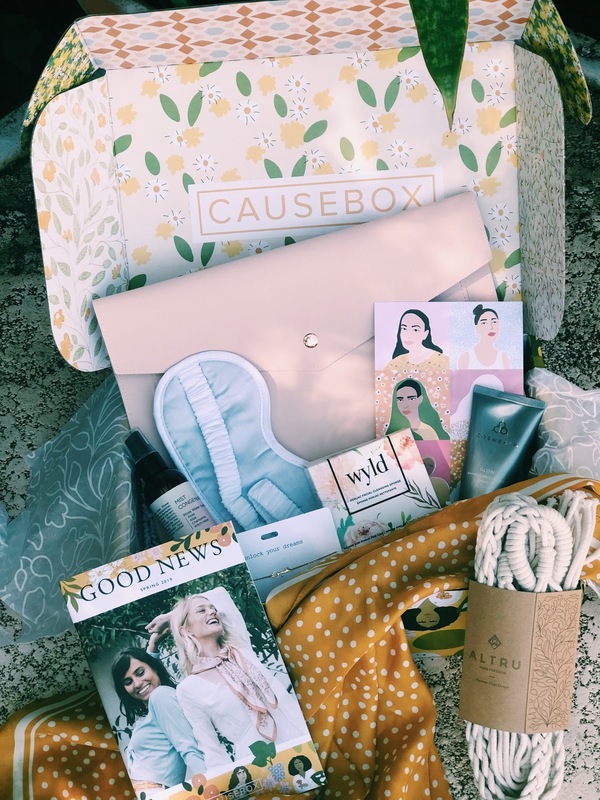 In addition, the spring box features an item that the Causebox Team designed WITH another company. Hint: It is my most anticipated item! What's IN the Spring Box? Beautiful, silky smooth. This scarf feels luxurious. However, I usually don't wear any shade of gold or yellow, But you never know til you try right?? So, I took the scarf off the dog and skeptically tried it on myself. Surprise. This is the first bit of yellow fabric that I've worn close to my face in I don't know how long! Currently it's tied around my head. I've also worn it as a belt and of course around my neck. 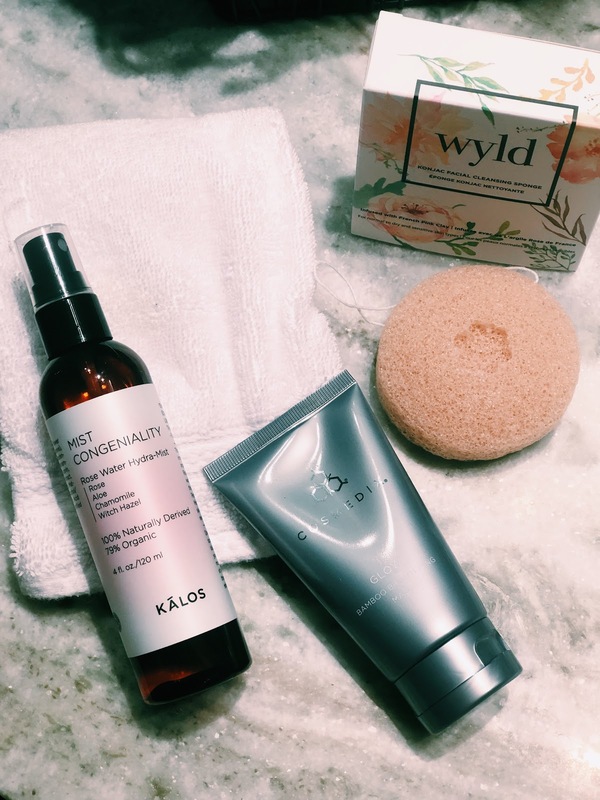 I haven't tried any of these products, but I love the concept of a hydra mist and who doesn't love a good mask! 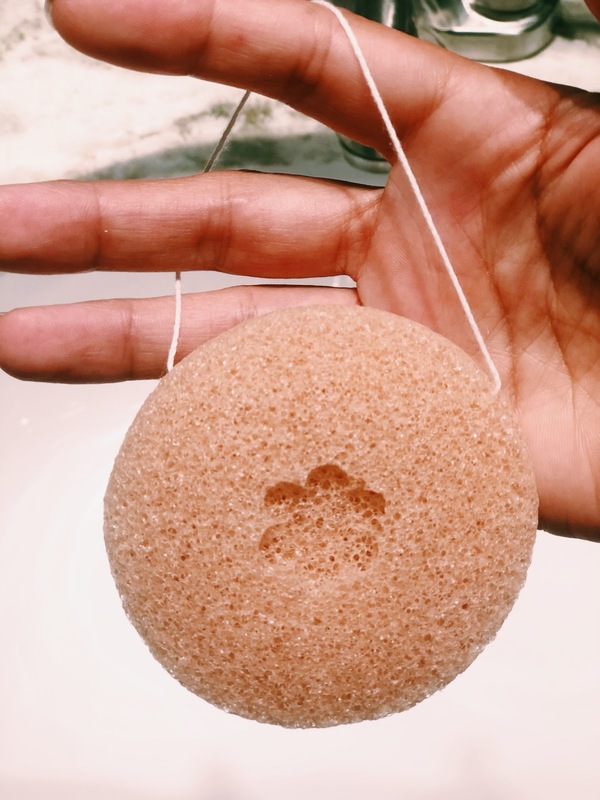 As for the sponge, it is rock hard and softens up when wet. I used it last night and loved it! Here it is! The much anticipated item! This beautiful vegan clutch was designed in three colors: grey, black and rose gold. It has several organizational pockets and feels like real leather - Swoon! So what's the problem, right? Well, I dreamed of different ways I'd use this clutch...toting my laptop in style to the coffee shop, upcoming vacation trips, etc. However, when I tried to fit my Mac I felt like Cinderella's step-sister with the glass slipper - grunting ungracefully, pushing and shoving. Oh, I got it in there, but not without considerable effort. My laptop is a hair too big. Sad day, right? I spent another 10 minutes trying to get it back out. Won't be doing that again. However, I found that my Cultivate Power Sheets and accessories fit perfectly so not all is lost!! Also, after a little investigation I learned that the newer models do fit (mine is a 2015). Chrissy you are the cutest! 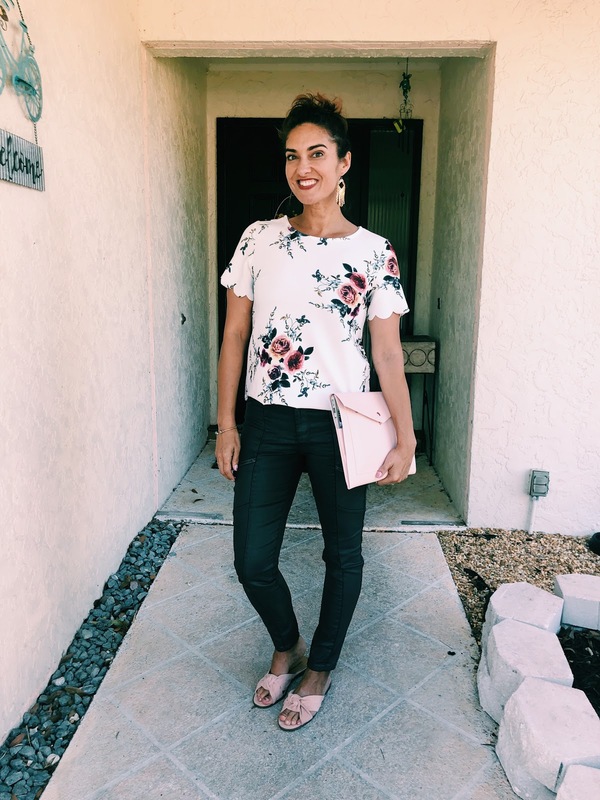 I love your floral top and faux leather! Great combo of feminine and edgy and PERFECT for our FL weather! 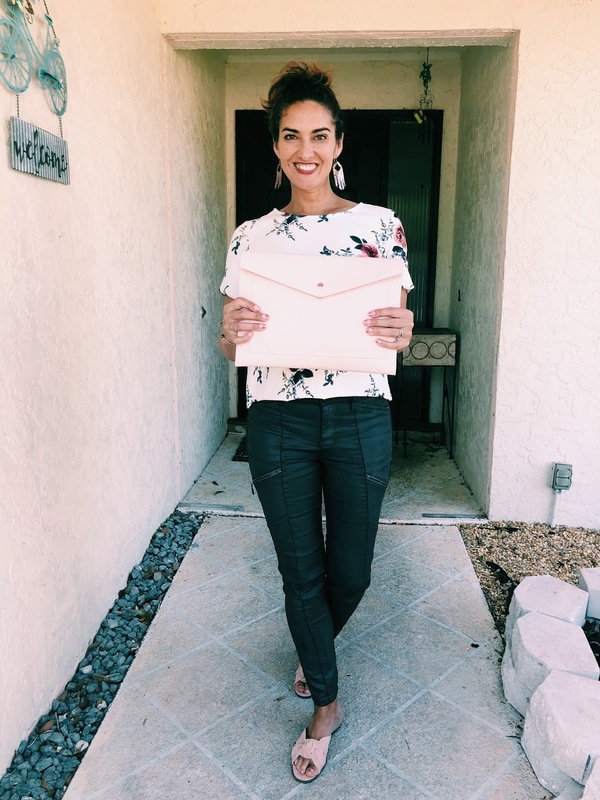 I loved watching you open your Cause Box and I'm excited about that portfolio and that silk scarf! I loved the way you wrapped it around your head on your stories - you wear that look well. Thank you Kellyann! I've been playing with that scarf everyday.lol. And the portfolio is beautiful. Another favorite for sure. SEnding you big hugs my friend! 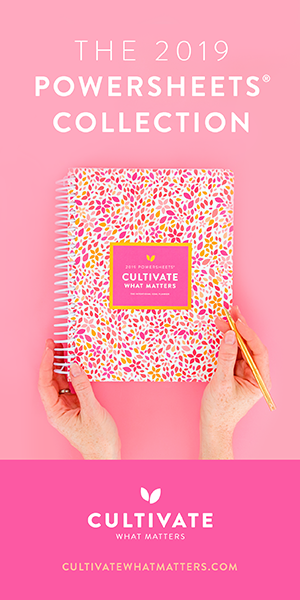 Your spring floral just makes me smile and that little added touch of yellow with polkadots, so super cute! You amaze me daily my friend, love you and have a wonderful Wednesday! 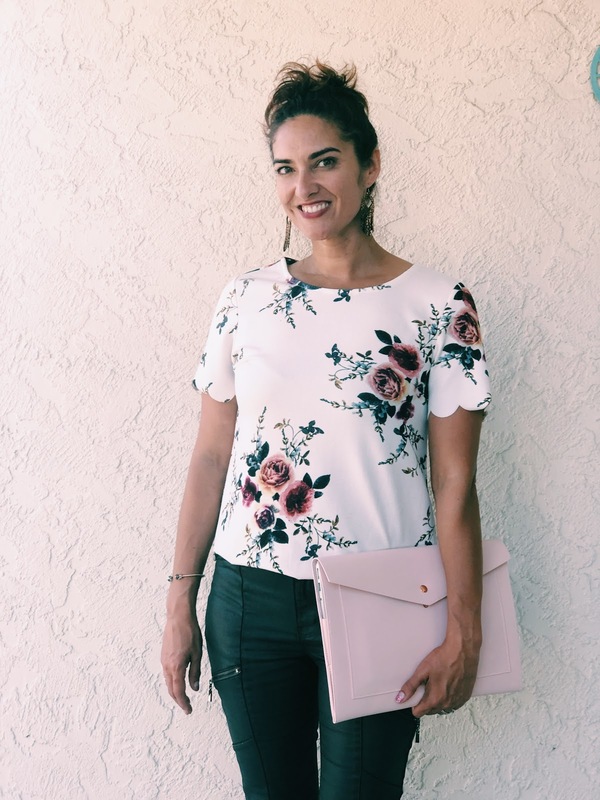 This pale pink floral is just gorgeous on you! 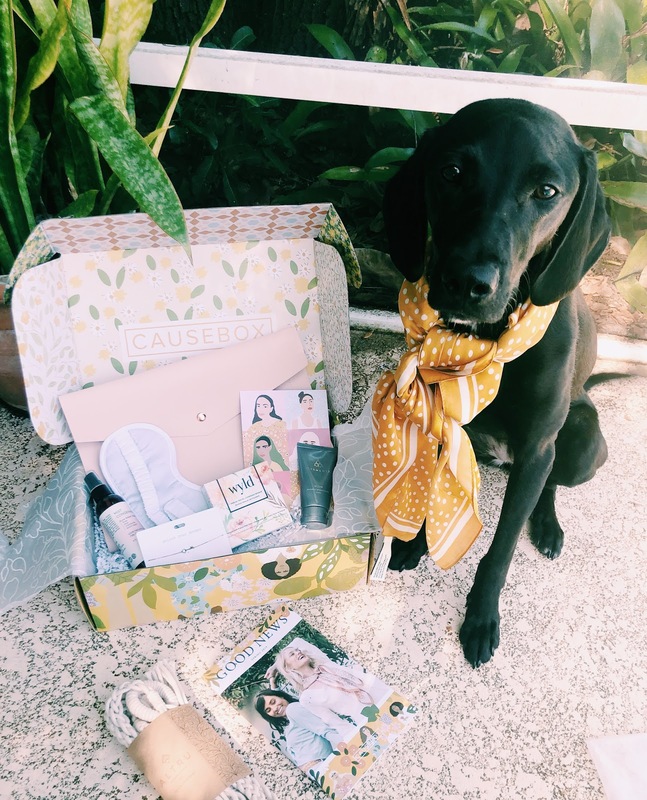 What great things came in your cause box and your dog is so precious!! I've never heard of this box, but what a great one. I do love the scarf (on you and on the dog...ha ha). It is a fun box Jodie. 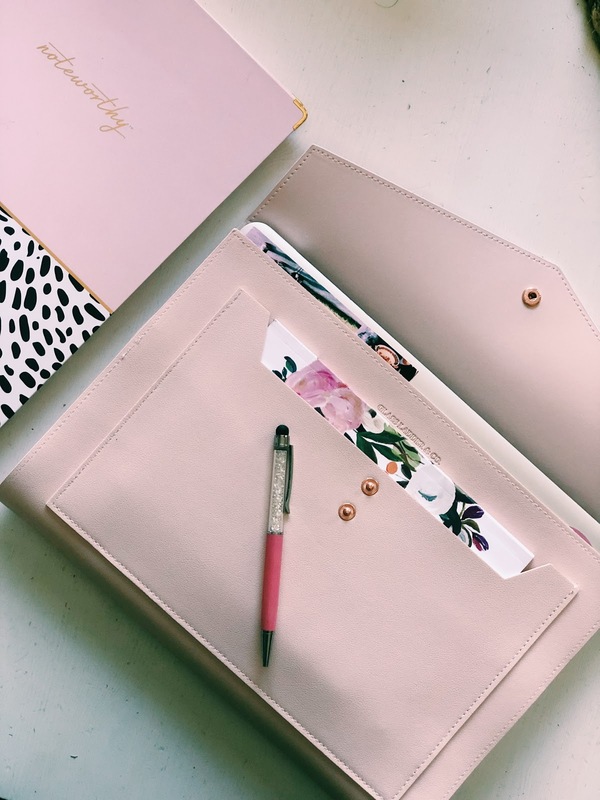 I love that the company met with a brand like Glass and Ladder and designed an item for the spring box - the Megan clutch. too cool! I haven't heard of Cause Box. So, in general you are pleased with everything, right? 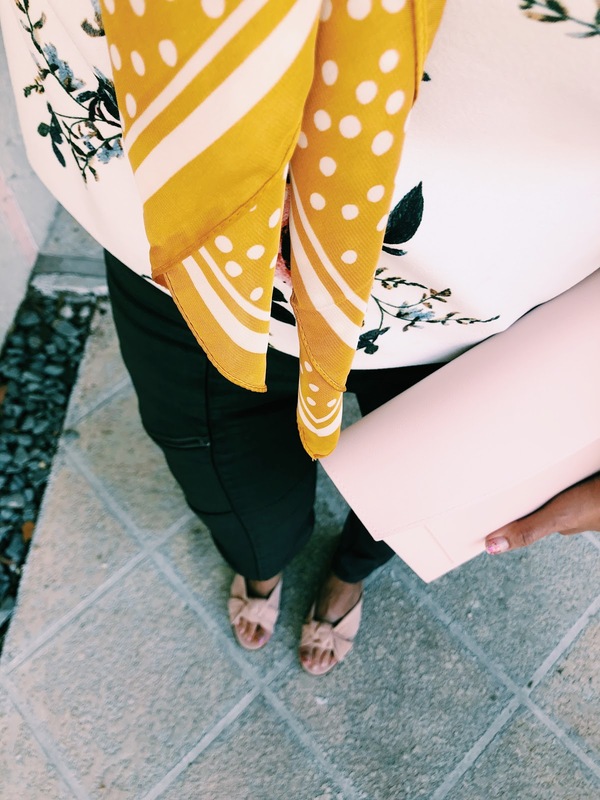 I like the color of the scarf, but the polka dots "lose me"! Please don't send your humid weather to us, yet! It's still on the cool spring-side here with low humidity, but I know we aren't far behind. Yes! And Thank you. Your comments inspired me to go back and add a few extra statements that this post was lacking. So thankful for this community!! hehe. Holding back the humid weather for as long as i can! I know! What year is your Mac book? Mine is a 2015 and one of the Causebox members said hers was the same. She said she stuffed it in there a few times and it stretched to fit. Glass and Ladder advised against it, but I can understand that! I may try overnight and just see. That's a shame that doesnt fit your laptop. Do you have a tablet it will fit? It's super cute though. So is Cause Box a more world friendly box? Different from Fit Fab boxes you see everywhere? Yes, they partner with entrepreneurs that are making a difference one way or another for good. It's mostly items (if not all) that are vegan, cruelty free, "clean", etc. For example the makeup palette I received in spring was free of several chemicals found in makeup. And all the beauty products in this box are natural and mostly organic. And thanks for the suggestion. I'm going to try squeezing my laptop in another time or two to see if it will stretch some. Haha. She does. For TONS of treats. hahahah! Absolutely LOVE that floral blouse on you, Chrissy! And I noticed you were wearing a scarf in your hair today on MP and I thought it was absolutely PRECIOUS!! Is it the same scarf in your pics? Boo to the hot and humid temps returning. Hoping that spring temps will stay a little longer in your area! awwww! thank you Laura. I should wear it more! As for the scarf, I've already worn it around my neck, head and waist. I just wear things out when I get them! And yes, hoping those spring temps stick around for sure! Loved the cliffhanger right off the bat here, and I am glad that you found an effective way to use the clutch. 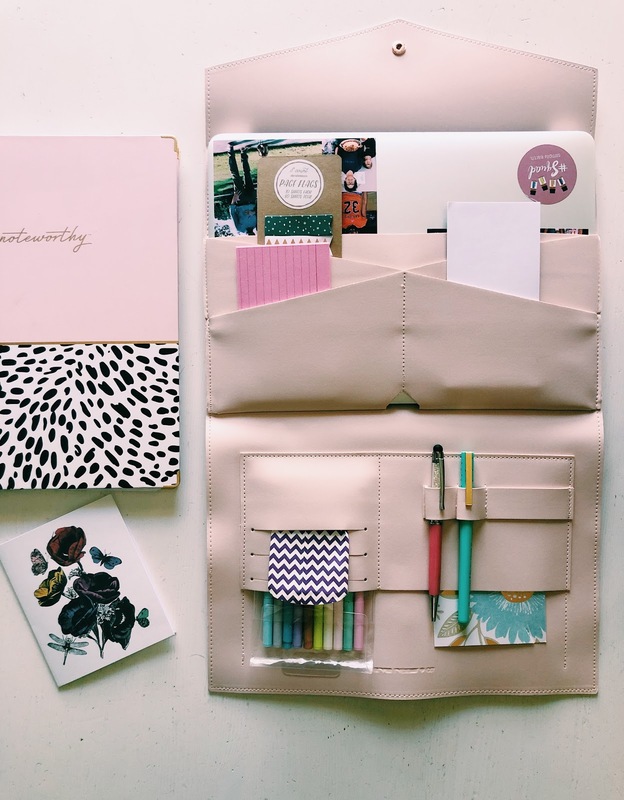 I adore the color and all the organizational items within it. That would be perfect for meetings/work. Also, I am swooning over your top. I could wear that over and over and over with pants or skirts to the office. Haha, thank you! I am trying and me too. I still may try to stuff this laptop in there a time or two and see if it will stretch some. Worth trying, right?? That portfolio is worth the entire box! That scarf is precious too and I just love that Miss Dolly posed for you. Shelly, I could see you sporting this portfolio. How big is your laptop?? And Miss Dolly...she might have been bribed. lol. That scarf and portfolio are beautiful! I love all the fun pampering items you got for yourself, too. What a great deal for the box! Do you tend to use all the items in each box? Please update if you're able to stretch it out! I was thinking of stuffing some other things in it for a little while to see if that'll loosen it up to accept my macbook air! What a pretty post. 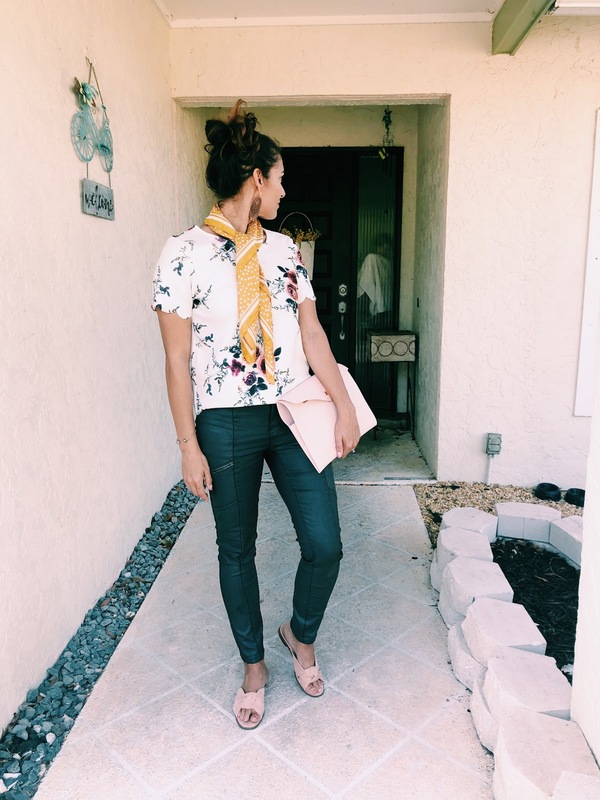 Your stucco entry makes a perfect backdrop for this outfit!! I have never heard of this subscription box, but to be honest, I don't know about any of them. I do like that they feature socially conscious items. For years, I didn't wear yellow because when I was younger my mom told me I looked seasick when I did! Ha. Now it is one of my fav colors to wear, so you play with that scarf and wear it with pride. You look so sunny. Thank you Leslie! I use my entry way for lots of photo back drops, mainly out of necessity. Ha! Trying to stay in the game! I will be taking this yellow scarf with me shopping if I intend to try a top in yellow. The shade matters quite a bit, doesn't it?? What a great clutch. Nice spring look! Since when do you have a dog? Thank you Nicole. It looks like Alaska is treating you well! And the dog came along after Christmas for the boys. They wore me down! lol. Thank you Jacqui! 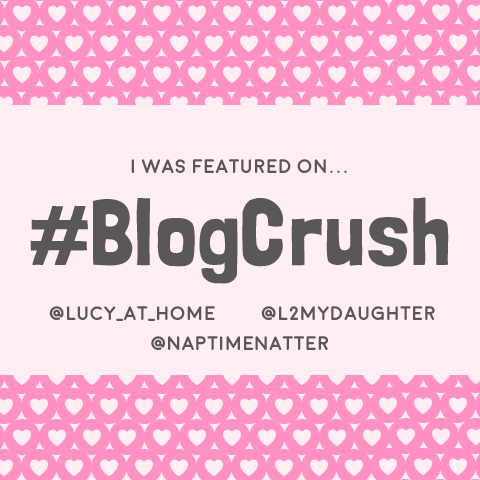 I love linking up on your site. That little top is the cutest! I love the scalloped sleeves and the floral print for spring! Wow, Chrissy, love this outfit on you! The scalloped detail on the pretty top is up my alley and those pants look fantastic, rock chic I say! I want a pair of slide sandals for summer, so easy to wear and they look cute. I love your clutch, sorry about it not fitting!